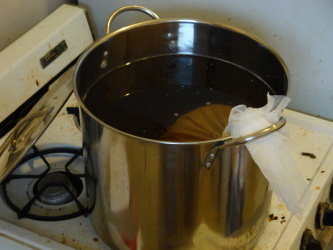 This entry was posted on Friday, July 3rd, 2009 at 23:49	and is filed under American Ale, Homebrew, Strong Beer. You can follow any responses to this entry through the RSS 2.0 feed. You can leave a response, or trackback from your own site. Came across your post when researching Saphir hops. I just did something similar this past weekend, except did a Lager version. 12lb Pale malt, mashed with decoction. One hour boil — 1oz Saphir at bittering, then 9oz for the last 10 minutes. Looked like split-pea soup… Excited to see how it comes out! Sounds good, though nine ounces of hops is pretty heavy. How is it?